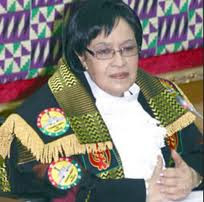 Mrs. Justice Joyce Banford Addo is a retired Supreme Court judge and Ghana's Speaker of Parliament. Ghana was left open and without a President for hours because Vice President John Mahama who was supposed to act in the absence of President John Evans Atta Mills was also in Nigeria for the commemoration of the 50th anniversary celebration of the West African neighbour. As at 2:00pm yesterday October 1, 2010 there was a power vacuum in Ghana as both the president and the Vice-President had left the shores of the country. Incidentally there was a massive bomb blast in Abuja a few meters from where the vice president had joined Nigerians to celebrate their golden jubilee. Ten persons were reportedly killed. Speaker Joyce Bamford Addo was later sworn in as president several hours later by a handful of members of parliament. Vice President Mahama had left Accra for Abuja early yesterday and it took parliament several hours to swear in the Speaker of Parliament, Mrs. Joyce Bamford Addo as acting President of Ghana. She acted as President for a few hours until the Vice President returned from Abuja. President Mills is currently in Japan doing government business. The swearing in of the Speaker of Parliament as acting President is in conformity of Article 60(11) and (12) of the 1992 constitution which states that the Speaker of Parliament must be sworn in and take over as President of the country in the absence of the President and his Vice but the constitutional blunder caused by the National Democratic Congress (NDC) government continues to receive flak from some sections of the public. President John Evans Atta Mills and his Vice John Dramani Mahama were in Japan and Nigeria respectively on official business and although letters were dispatched by their respective offices to the Speaker of Parliament who is next in line of succession a yawning power vacuum was created temporarily. The Speaker of Parliament issued a statement recalling parliament from their recess for her swearing in ceremony in late afternoon yesterday. The power vacuum created raised concerns particularly in the media over what was seen as the government could commit such a blunder. Atta Akyea, private legal practitioner and MP said the issue of who acts in the absence of the President should not be an issue because it is clearly explained under Article 60 (8) of the 1992 Republican Constitution. He said taking into consideration the Order of Pre-eminence in Article 57 (2) of the 1992 Constitution, the Vice President acts in the absence of the President and in order not to create any power vacuum, the Speaker of Parliament and then the Chief Justice follows in that order. He said the Speaker or the Chief Justice does not even have to swear an oath to act as President because by use of parity of reason under Article 57 (2) and by operation of law the framers of the constitution are clear on what should be done. But Ace Ankomah another legal practitioner disagreed and said the Speaker needs to swear the Presidential Oath if she is to act as President. Ace described the temporary power vacuum as a slip in timing. “Somebody should be more alert”, he said. During the World, both the President and the Vice President had left shores of the country for South Africa with nobody appointed acting president, leaving Ghanaians like orphans, for some hours.